5.46 points at 13 votes (rank 721). 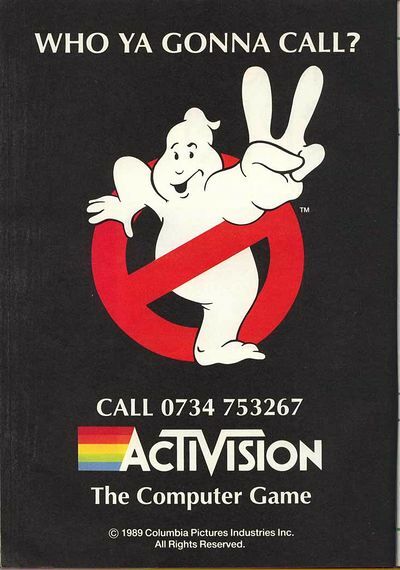 Ghostbusters doesn't exist anymore! The last real job they had involved bubbling up a 100 foot Marshmallow man and blowing the top three floors off an up-town high rise for which they were sued. The citizens of New York believing as time passed that they had been victims of a colossal hoax. The Ghostbusters team now earn their living hiring themselves at parties, running occult bookshops and appearing on seedy occult TV programmes. It's winter time and the New Year is just around the corner. Dana Barrett has returned to live in the city with her baby son Oscar. The city seems even more paranoid than she remembers it. She is returning from the store laden with groceries when the buggy Oscar is travelling in begins to jolt forward. The brakes unlock themselves. She reaches towards the handlebars, but the buggy rolls forward just out of her reach and stops. Surprised by the movement she reaches for the handlebar again, but this time the buggy rolls even further away. Alarmed now, Dana hurries after it, but the buggy keeps rolling down the street at ever increasing speed. Dana chases the buggy down the street, shouting to passing pedestrians for help, but everytime someone reaches out to stop it, the buggy swerves and continues unchecked. It comes to a dead stop in the middle of the street, a bus narrowly missing it by inches. Cars and trucks swerve and hit the brakes as Dana runs to the intersection and snatches up the baby. She hugs him close, deeply relieved, then looks at the buggy with the dawning awareness that the supernatural hasre-entered her life. When there's something strange in your neighbourhood, who you gonna call? GHOSTBUSTERS! 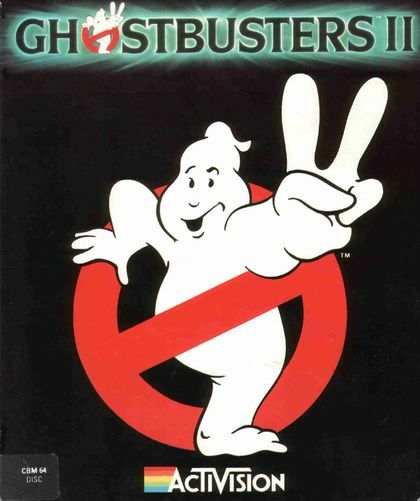 The game Ghostbusters II is based on three episodes from the movie with the same name. The three parts of the game differ substantially. The PKR bombs are used by keeping the fire button on the joystick pressed and moving it up or down to aim. To ignite the explosion let go of the fire button. 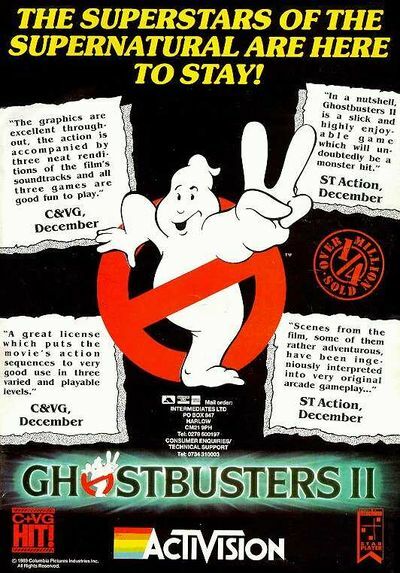 When the Ghostbuster ropes down from the roof, press the joystick upwards to open the hands and downwards to close the hands. To change the weapon, place the cursor on the desired weapon and press fire. Move the weapon to its new position and let it drop by pressing fire once more. You need to lead the Ghostbuster to the end of the air shaft so he can collect slime samples there. Make the Ghostbuster swing to the left and right, so that he can pick up items from the sides by touching then with the feet. When a ghost touches the character, he will loose courage on the display at the lower right of the screen. The display can be refilled if you pick up bottles that contain elixier from the sides of the air shaft. 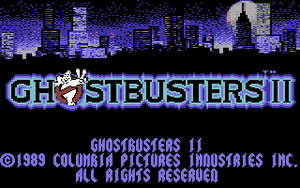 When the face in the courage display shows horror and the bar has reached its lowest level, the Ghostbuster will let go of the cable and fall down. The cable itself can be attacked by special ghosts, the saw monsters, which come out of the side walls from time to time. These annoying creatures will saw at the cable until it snaps. A close view of the cable can be seen at the right side of the screen. 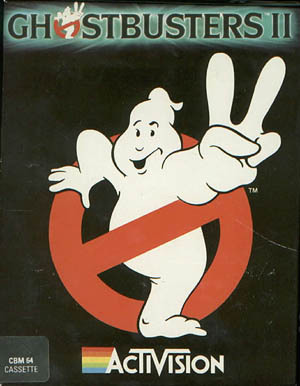 Before this happens, the Ghostbuster should destroy the monster with a PKR bomb - a fall leads to the end of the mission. To be able to get a slime sample, three parts of the shovel need to be collected first from the sides of the air shaft. 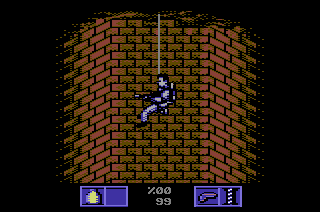 The hero has three different weapons to choose from: These can be chosen by pressing the SPACE key until the desired weapons has been reached. Further PKR bombs and shields can be picked up at some places in the air shaft. 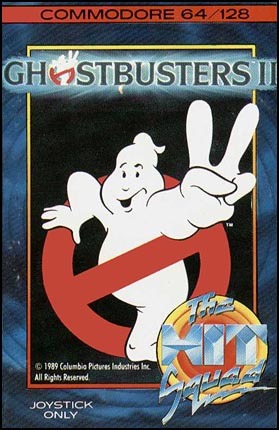 You need to help the Ghostbuster to reach the Museum of Art before the beginning of the new year. The Ghostbusters are in the crown of the Statue of Liberty while it moves down the Broadway. 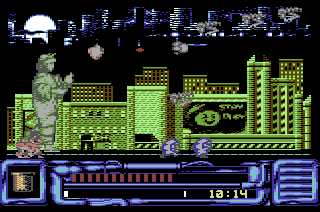 The fire ball is steered by you and you need to defend the statue and the inhabitants of the city from the evil ghosts which are eager for destruction. 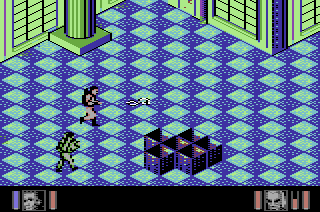 The Statue of Liberty is run with slime, that is shown by a gas bottle at the left side of the screen. Each time the statue is hit by a ghost, the slime level will lower. You have only a limited amount of shots available, which are shown at the lower board. If you do not have any ammunition left, the fire ball will extinguish and a new will form at the torch of the Statue of Liberty. This in turn lowers the slime level about the amount of energy that was needed for the fire ball. When a fire ball hits a ghost, it will turn into a drop of slime that falls on the pavement and stays there until a new wave of ghosts appears. The statue's slime level can be refilled by the inhabitants that run up and down the street and collect the drops of slime. For this you use the space key. As soon as a person touches a drop of slime, it will automatically be added to the statue's supply. The long bar shows the distance that the Ghostbusters have already covered with the statue. 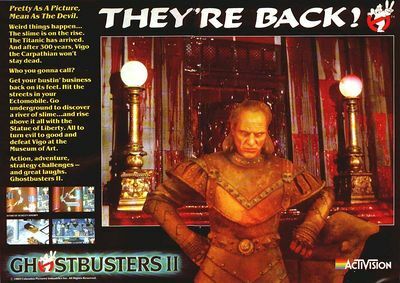 The baby Oscar has to be saved and the Vigo of the Karpathier needs to be destroyed by steering all three Ghostbusters. On the internet POKE 51746,173 circulates as a cheat - unfortunately without stating the effect. Shmendric: "Part one good, part two bad! Which counts for the two movies, also counts for the two corresponding games. 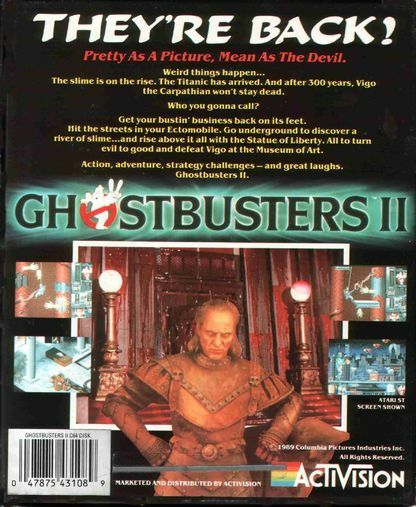 I could not get warm with any of the three stages of Ghostbusters II. The part in the sewers is not a problem any more after a few rounds of practice, but it stays a hectic swinging to and fro, which is not much fun. The middle part of the game is a bit too drawn-out for my taste and simply offers too little appeal in playing. And the final is a desolate shooting around. Compared to the forerunner, the sound seems much more filed, but unfortunately all the charm was filed away with it..."
This page was last modified on 6 September 2015, at 13:41.